The Prayer Labyrinth offers a unique setting and approach to personal prayer time. The Labyrinth will be open every Thursday during Lent. There will also be a brief communion service each Thursday night from 6:00 until 6:15pm at the Labyrinth. Our Maundy Thursday service will begin at 7:00pm in the church sanctuary. The twenty-fifth production of The Last Supper by Ernest K. Emurian will be performed by members of the Boone UMC’s congregation as part of this night service. The service will conclude with Holy Communion and the stripping of the altar. The Stations of the Cross has long been a common way of reenacting the suffering of our Lord’s last journey in the city of Jerusalem carrying his cross. Stopping at each remembered place along Christ’s way reminds us of His sacrifice and encourages reflection and contemplation. Its inspiration came from the desire to imitate the journeys of early Christian pilgrims to the Holy Land, especially to the places of Christ’s redemptive suffering. 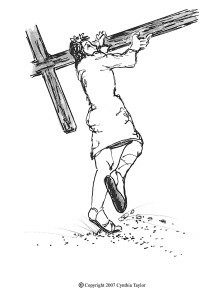 Join us on April 19 and experience the Stations of the Cross through the artwork of Dr. Cynthia Taylor. The fourteen stations will be open in the sanctuary from 9:00am until 6:30pm. 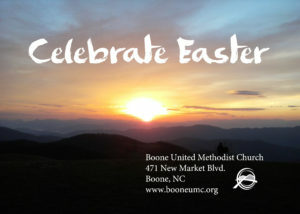 BUMC’s Good Friday service will begin at 7:00pm in the sanctuary with “Christ’s Seven Last Words”. Children of all ages will be delighted as they explore hands-on activity stations and participate in meaningful response opportunities to the greatest act of love of all time. Children and families can sit with storytellers as they shared the Story of Easter. 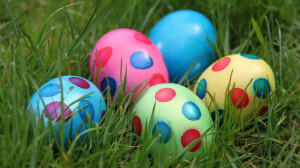 As always, the Egg Easter Hunt will begin at 11:00am come rain or shine.